On August 25, you could drive away from the 89th Canadian Derby in a 2018 Lexus NX 300 F Sport in partnership with Lexus of Edmonton | West. Each qualifying participant will randomly draw a horse running in the 89th Canadian Derby race. The participant with the victorious horse will win the 2018 Lexus NX 300 F Sport! 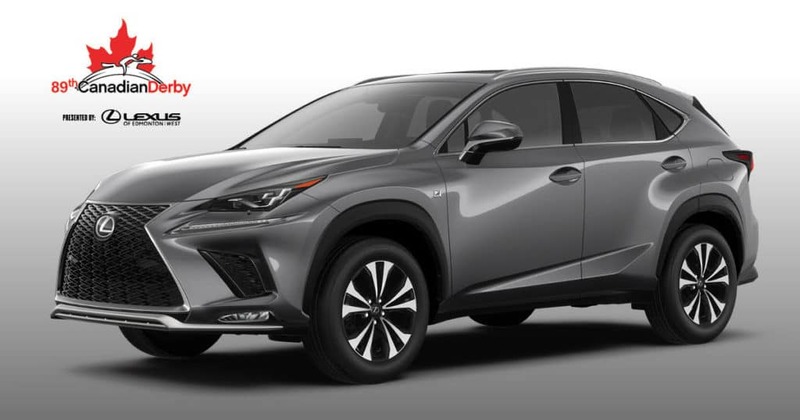 Lexus of Edmonton is pleased to give away 3 of the 12 qualifiers for a chance to Win the 2018 Lexus NX 300 F Sport. Check our Facebook Page weekly for chances to earn a qualifier. Comment on our Lexus of Edmonton 89th Derby Facebook Post. Like and Share and comment what you love the most about Lexus of Edmonton West. See contest rules below for full details. Must be present for a chance to win on August 25, 2018 at the 89th Canadian Derby. We will make a Random Draw at noon on August 3. The winner will receive 1 of 12 qualifier tickets for the final race day. Play to qualify! Casino guests can print off entries daily at the Casino and bring them to each of the below qualifying finale nights to compete for the chance to win an entry into winning the Lexus! Dressed in your fascinator and bowtie, be sure to head to the draw barrel on the tarmac for your free entry to become a qualifier! There will be six lucky qualifiers drawn on the day of Derby. Guests whom booked a seat in Colours or purchased a ticket for the Infield Experience will receive an additional entry! The draw barrel will close three races prior to the Derby race. Qualifier must be present at the 89th Canadian Derby, August 25th to participate and win. Qualifier names will be drawn at the winners circle, two races prior to the Derby race. One race prior to the Derby race, qualifying participants will meet near the winners circle to draw their respective horses. Whomever has the winning horse as “their” horse will win the 2018 Lexus NX 300 F Sport. Other qualifying participants will receive $100 cash. In the event of a scratch prior to the race, the draw will include only the amount of horses remaining (for instance, if there is one scratch the day before, only 5 participants will be drawn on the day of Derby). If a horse is scratched right before the derby race, the qualifying person assigned that horse will still receive that horse; however, will not be eligible for the grand prize.